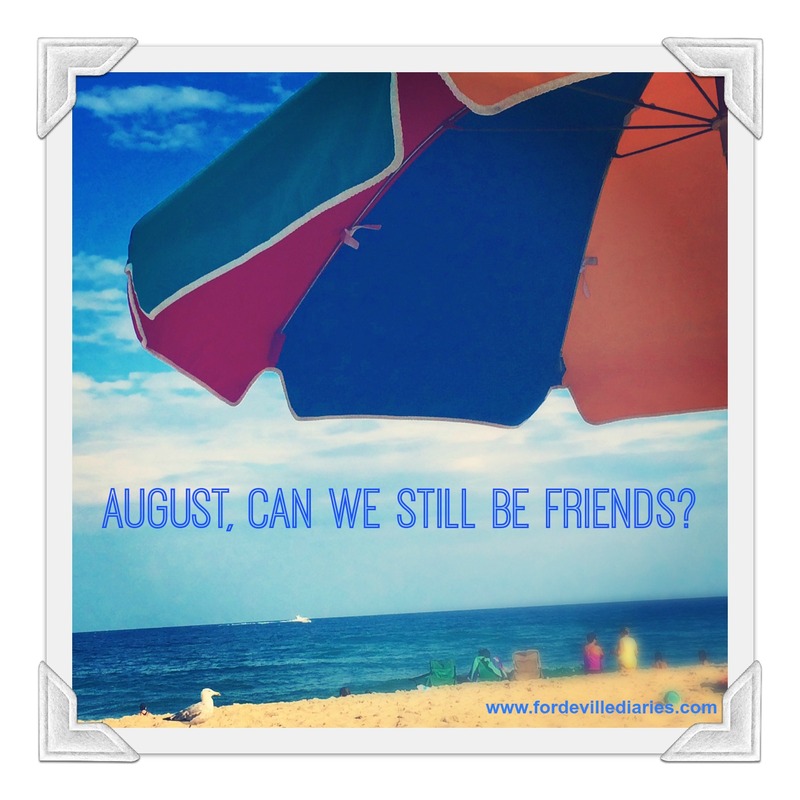 August, Can We Still Be Friends? Welcome, August. I want so much to tell you how good it is to see you, old friend. Because so much magic happens on your watch every year, even though you signal to my brain that we only have this one final month of summer left before school starts in early September. But, August, each year you seem to get more aggressive in barreling toward fall, toward school, toward tasks and the routine of getting us back to business. And the truth is that I want my old Augusts back, the ones from my childhood where a full month was still a pure 31 days and nights of all that summer vacation brings. August, I could learn to love you again. If you could just let me finish up what summer means to me. Because I haven’t yet caught a firefly in a jar for my kids. I haven’t marveled nearly enough at how late the sun stays out. I haven’t even bought that pair of flip-flops I wanted. No, August, I’m not ready for the retail displays of fleece and Uggs and leather boots and jackets. Not ready for the fall PTO sign ups, the scheduling of which day we’ll do soccer or swimming or ballet. Certainly not ready to give up ice cream and popsicles and the smell of my grill and the sight of that rainbow of fresh fruit. Not mentally prepared to abandon sleeveless sundresses for my daughter and me, and easy onesies for the baby. And bare feet for us all. The very thought of socks and closed-toed shoes makes me shudder. Say it isn’t near. Say that I have time to try that other bright pink nail color on my toes and not the deep dark hues of grays and purples and browns. You see, August, I still have two (yes, two!) legitimate family summer vacations I haven’t even taken yet. I have packing to do. Twice. I have more sunscreen to buy. I am not thinking about unpacking or vacation ending or looking back on it. Not even a little. The snapshots that I will etch into my memory and put into photo books haven’t even been made yet. This house is still ripe with the anticipation of new destinations and shorelines with friends and family. August, I don’t want to spend your days filling in my calendar with the school closings for the year. I want to hang damp beach towels and bathing suits on my deck rail and smell the faint chlorine and sunscreen and perhaps the rain left on them. Surely you understand that there are meats I haven’t yet grilled, sangria recipes I haven’t tested and frozen yogurt combos I’ve been meaning to try. I still feel like putting my coffee over ice is a seasonal novelty. I haven’t had a single lobster roll yet. And we haven’t begun to grow remotely tired of the new deck lights strung overhead as we eat and drink. Our new fire pit barely shows the wear of the s’mores it has created and the late night cocktails it has beckoned with friends and neighbors. The camp backpacks we were issued have hardly been broken in. And my older two kids have plenty of places on their summer wish lists left to visit. The zoo awaits us, August. So does our annual trip to Daddy’s office, not to mention more mini golf and the boardwalk rides of our beloved Jersey Shore. There are many more waves to jump over and outdoor showers to take after the sand stays between our toes and the taste of salt water sticks to our lips. August, I’m just getting used to the down time that allows me to give the baby the two naps a day he deserves. This sweet boy has enjoyed a summer not dictated by his next schlep in a car seat to pick up or drop off a sibling somewhere. I imagine that his tiny head can barely even fathom how much time he has to explore his newfound mobility and just play. If you rush us, August, he’s right back in that car seat and we’re just not ready yet. There are blocks to stack and steps to take and mashed fruits to wear. Yes, I know you have certain obligations to prepare us for school and I have made a few related purchases here and there. You would be remiss if you didn’t present any of this to me. But I feel like you take it just a little further every year. I’m not sure you need to associate yourself with corduroy or Halloween. Don’t you want to be all about shorts and sundresses and deck chairs? I’m here to tell you, August — as your old friend — that it’s not too late to reclaim all of this as yours. Don’t let April or May take it from you. I know it’s possible for us to remain good friends and rediscover how things used to be between us. So, come find me while I get ready for two beach vacations. Visit me as I grill at home and listen for the ice cream truck on my street. And, by all means, join me over the next 31 days on the deck, barefoot and sipping summery evening drinks under the long-lasting sunlight. We’ve noticed each year the summers get shorter…by July 1st LD is telling me “summer is almost over”! Enjoy all 31 days and nights! We will be chasing our fireflies tonight! I can’t believe it’s August already! There are so many things I haven’t done yet either! I can totally relate! Last year I wrote a letter to summer asking it not to leave me. I know exactly how you feel (and that great minds think alike). For some reason I feel like as soon as August hits, it’s over. I love summer and I swear when Fall hits I go into a depression.